ContentBlocks ships with a lot of icons by default. These cover most use cases and input types that are included in the core, as well as a bunch of icons for different layout configurations. 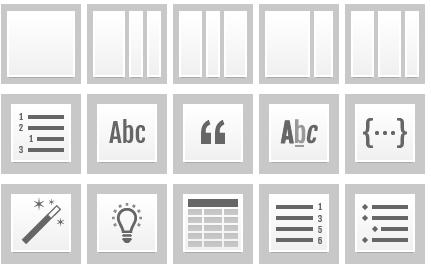 These icons were designed specifically for ContentBlocks by Jon Wallace Design. 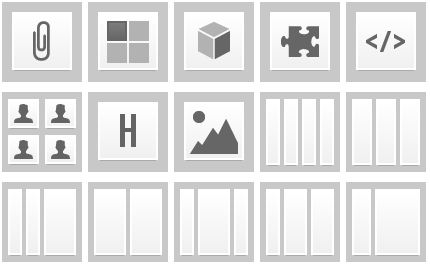 All these icons are retina-ready too (not on this page), so should look great on your fancy screens as well. have a @2x variety at 160x160px for retina screens, so if you have customicon1.png, you will also need [email protected] that is twice the size. If you made a wicked custom input that you want to distribute and you need an icon for it, get in touch. We might be able to help with a free icon. To aid with creating custom icons, Max Mitchell wrote a shell script that is available on GitHub that will automatically build new icons for you. It will take your input images/icons, and place them on top of the right background and in the right size. Check it out here. You can also use this PSD to create icons (provided by Sebastian Marinescu).